You can ignore Valerie Thompson as just another pretty face in pink dresses trying out her hand in motorcycling, just like a lot of people and critics did until she made everyone look back with what she offers on the field. You too need to look at her credentials before assuming the routine path. For starters she is into drag racing. If that has not made you take a second look at the pretty face, you must be lying. Wait a minute, a lady drag racing! That’s right. And she has been doing it since 2005. Well, of course, when she started out, she was given the royal ignore, but for how long can you keep talent like Valerie unnoticed? Okay, let’s start with her career graph just so that you know whom we are trying to assess here. In 2005, as mentioned, she started to follow her passion and dream. Before that, just guess what she was into. Banking! Can you take that? Well, actually it does make more sense, I mean a pretty face wearing a corporate dress sitting behind the counter is actually what you normally expect and not behind the handle bars of some mammoth gigantic machine getting ready to snap your head at the first twist of the throttle. Yes, she was a banker, but I guess what the banking sector lost was a very good profit for the motorcycling world. 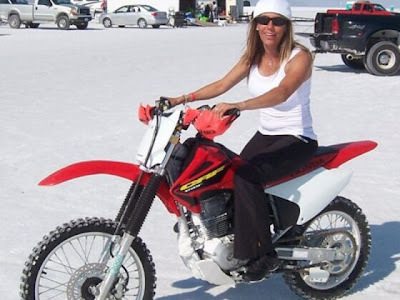 Just a year later, in 2006, she rode into Bonneville Salt Flats Land Speed Records. That was followed by a Runner-up position in Western Division - V-Rod Destroyer, a 3rd finish in Harley Drag Racing Association National Championship Series and named “Best Appearing Team 2007”, all in the year 2007. And yes, she was back in the Bonne Salts. So, in 2008, it read “Valerie Thompson - 2-Time Land Speed Record Holder”. 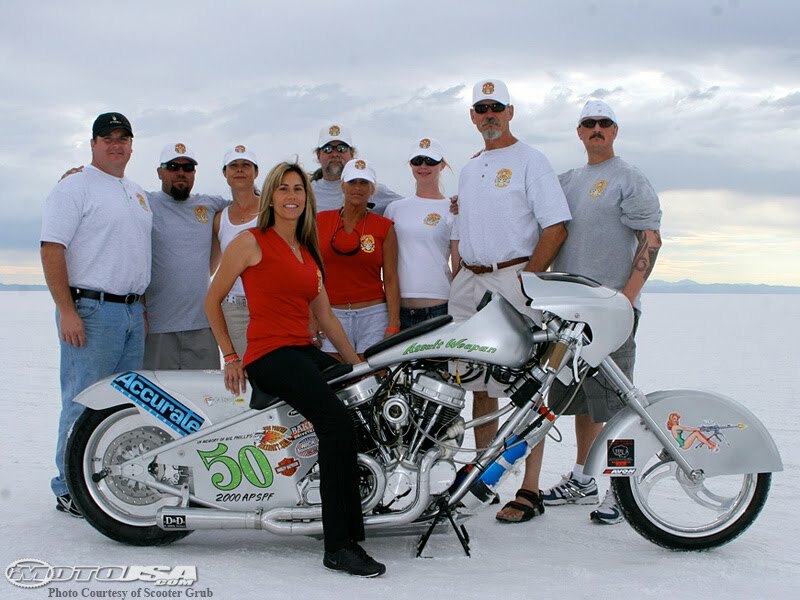 Then in 2008, she made her NHRA Pro Stock Motorcycle Debut at the prestigious Mac Tools U.S. Nationals. 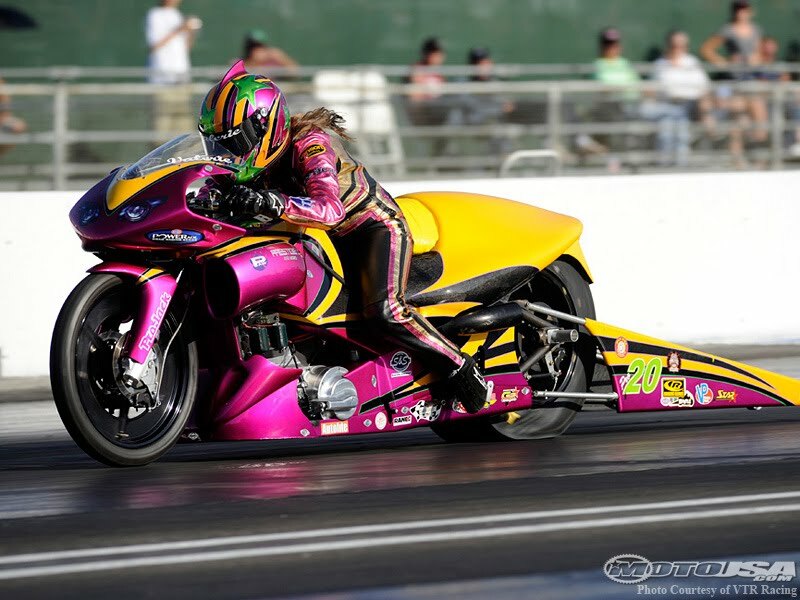 The same year, she had attended Frank Hawley’s NHRA Drag Racing School and earned her Pro Stock Motorcycle license. When you repeatedly she anyone so enthusiastic, it really gets hard to ignore. Valerie actually was always fond of motorcycles, rather speeding motorcycles. She did a lot of street racing down Scottsdale Road, her hometown and then one of her friends advised her to take her passion to the tracks. In two months, she was seen in the tracks in a 2000 Fat Boy and she never looked back since. The Fat Boy was her first drag motorcycle. From 2005 Valerie started competing in the All Harley Drag Racing Association (AHDRA). The Fat Boy later was replaced by a V-Rod when she teamed up with Custom Performance of Phoenix, Arizona. In 2006 she made her debut aboard the Hacienda Harley Davidson-backed V Rod Destroyer and finished a very respectable 6th in the National Super Gas class and in the following year she improved it to 3rd. Her sponsor, Legend Air Ride Suspension and the owner of the firm, Jesse Jurrens wanted her first to try out at Land Speed racing. She tried it out with the V-Rod and went 153.561 mph in Run Watcha Brung at the Bub Speed Trials. Yes, she was impressive but can can she stand up and make her head visible from the lot of riders who clock 150 odd? That was when she met Keith Ball of Bikernet.com. Actually Bikernet happened later, Keith was always a visionary bike builder. So, Keith designed a Panhead motorcycle that would take Valerie from the riders who clock 150 odd to being a world record holder within a season. The panhead is named ‘Assalt Weapon’ and although many Panheads have graced and raced in the Bonne Salts, this was the baddest and meanest and was also more aerodynamic. In 2007, Valerie had the APS-PF-2000 record at 156.717 mph with a top speed of 161.736 atop the Assalt Weapon. Now that was pretty impressive for Valerie and also for the HD Panhead, since if you recall, the Panhead is basically a motorcycle belonging to the 50s that is more than half a century old! 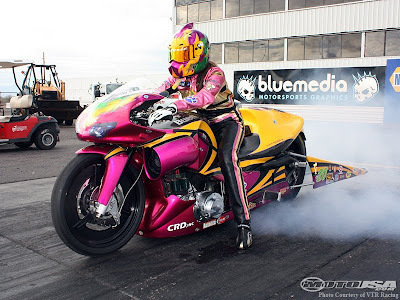 In 2008, she left AHDRA to concentrate in motorcycle drag racing and her goal was set on the top-tier level of competition, which is the NHRA Pro Stock division. The NHRA division is much different than Land Speed racing and here you have a team much like MotoGP. 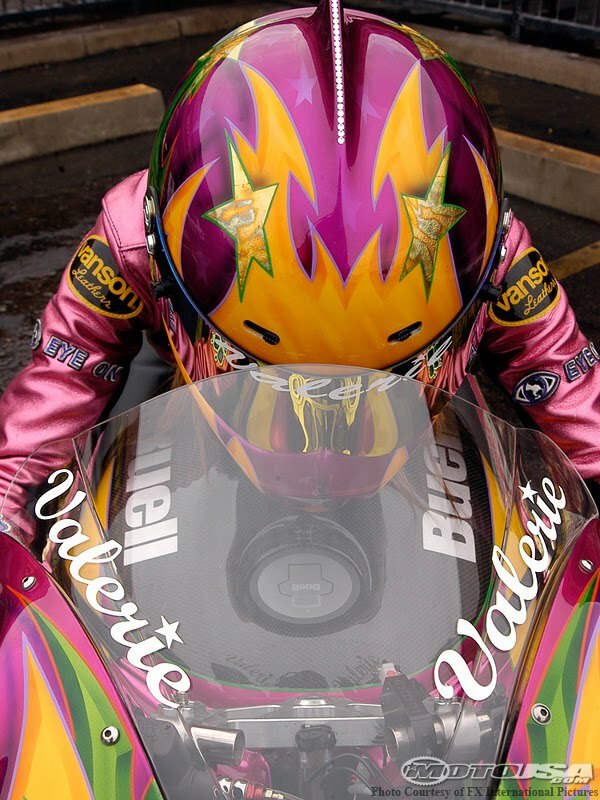 Valerie had her own team, known today as Valerie Thompson Racing LLC which meant she not only needed to concentrate only on racing like most other riders, but she also had to look at the logistics of managing a team. For this one needs money, and after a contract deal didn’t materialize, she put money from her own pocket. She was that desperate to try it out at drag racing. A few suggested that she needed more seat time, but she responded that she has cut short 2 seconds from 9 to 7 within a year and of course she was not going to listen to anybody as she has already made up her mind. So she set her sights on a Buell. And again there was no looking back. At Wisconsin International Raceway, Valerie got her first win. The specifications of the bike is of course something one looks forward to, just so as to know what kind of bikes these guns drive on the quarter mile. 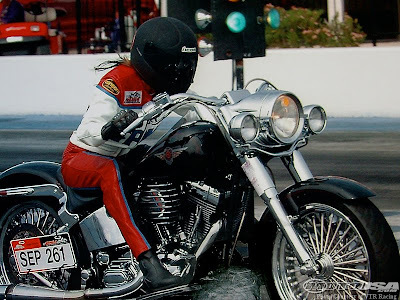 Okay, the made up 2008 XB9R Buell racing in the Pro Stock Motorcycle of the NHRA POWERade Drag Racing series covers the quarter mile at 7.05 Seconds @ 187.42 mph that is 300kmph. The body material is carbon fiber and construction is a mixture of chromium and molybdenum. It has a 70” wheelbase and supported by Mickey Thompson tyres both in the front and rear. The overall length of the bike is 12 feet and width is the normal 24”. It has dual disc brakes up front and a single disc at the rear. The engine is sourced from S&S Cycle and it is a 60 degree V-Twin with 160 cubic inches displacement. Power output is over 340 hp @ 8600 rpm. Transmission is also from S7S Cycle and has 6 gears (I wonder how they engage to the top gear in less than 7 seconds!) The bike is fuel injected by Magneti Marelli. The cams, billet aluminum cylinder head, pistons and cases are all from S&S Cycle. But at this level, it is difficult to sustain without a proper sponsor and the sponsor also need to have deep pockets. Now without a sponsor, she has been laying idle but she is hoping for a return in 2011. The lady also had to sit out in 2009 due to lack of sponsorship. Nonetheless, you cannot put down so much enthusiasm just due to the lack of a single component. Come to think about it, in 3 years, from 2005 to 2008, Valerie has made a name for herself and with such a big impact. She has earned her way from the All Harley Drag Racing Association series, to becoming a NHRA team owner and licensed competitor in drag racing's most elite class, of the Pro Stock Motorcycle Series. In a field dominated by men, this lady is an inspiration and a superb brand ambassador for motorsports fans world wide. Valerie is looking forward to the 2011 season with a bike that promises to hold true to what Valerie has set out for. And yes, she hopes to join the 200mph club in the next Bonne Salts session. I believe it is more a question of ‘when she wants’ rather then ‘how soon’.Okay, before I forget, let me tell you another thing about her. I am sure you are aware of GoDaddy.com, yes the same commercial made famous by former WWE Diva Candice Michele, Valerie has posed alongside Danica Patrick strutting her stuff on national television during the Super Bowl for a GoDaddy.com commercial as she was racing under the GoDaddy banner in earlier years. Of course, a chick (although I should not be using the word, nonetheless), a talented chick in the world of motorcycling is always going to be a media magnate and Valerie is no different. You can join Valerie’s official Fan Club or make a contribution to her racing program by visiting her website at www.valeriethompsonracing.com.